You must make reservations at least 5 minutes in advance of the time at Del Ray Cafe. From the owners of La Bergerie, a French café serving local, natural, and organic products. Breakfast served Monday thru Friday 8 a.m.-10:45 a.m. Brunch served Saturday, Sunday & Holidays 8 a.m.–2:30 p.m.; Did you know? - We sell our croissants & baguettes "To Go"
The Del Ray Cafe nestled in it and Alexandria neighborhood was so very inviting and beautiful. From the entrance to the upper level of the atmosphere was family-oriented, cozy, and welcoming. The food was fantastic French cuisine. From the mussels and scallops to the apple tart with cinnamon ice cream, this was a wonderful dining experience. Loved this place! We'll return. First, it is a charming little restaurant (looks like a house in that neighborhood) with flowers and a sitting bench in the front yard. It's also popular for brunch, so reserve in advance. Our food was excellent, you can certainly tell the difference between regular and organic ingredients! Our waiter was extremely friendly and very accommodating, even helping our 95 year old down the stairs after we added her to our family celebration but couldn't change the location of the table for our party. The cost was reasonable. One caution: if you bring your own cake or dessert, be prepared to pay a plate charge of $5 per person. Del Ray Café was fine and would recommend the restaurant. However, Open Table really messed up our reservations in just about every way possible. Fortunately, the good folks at Del Ray Cafe found a place for us even though we had no reservation. Open Table had the correct time but the wrong date. We will return to the Del Ray Café but make our reservations directly with them. Definitely make reservations. It gets really busy especially on weekends. I took my parents for lunch to celebrate my dad’s birthday. The restaurant was bright and airy. The food was fresh and delicious. My tuna salad had more mayo than I’d have liked but the country pate appetizer was really good. The service was great - our waiter was attentive and cheerful - and my dad was served a complimentary puff pastry to recognize his birthday celebration so it was a really nice touch!! I brought my family of four to Del Ray Cafe to celebrate my husband's birthday. I was hoping for something special at a place that was new to us. Unfortunately our dining experience left me feeling like I had been taken advantage of. The biggest problem was with our waiter. He was cordial enough, but I got the feeling when we didn't order multiple drinks that he was "put out." My husband ordered a glass of wine which the waiter refilled without asking, and then charged us for. When he took our entree order he presented the options of salads, soup, and dessert in a way that implied they were included with the dinner. I should have known better. There was no mention of anything included with the main courses, and salads and soups were listed separately on the menu. He was "upselling" us and I didn't realize it, neither did my teenage daughter. Because of that, and the unrequested wine refill, our bill was about $40 higher than it would have been otherwise. After our entrees arrived the waiter did not show up again. The servers were very attentive, refilling water, clearing plates, and bring containers for leftovers. But we had to wait a long time to receive our bill and it was too high for the food we received. My husband's fish was a small portion and not particularly tasty. My lamb wall well cooked but lacked seasoning. The kids did better with the mussels and chicken, but on the whole it was not great. On top of that the volume in the restaurant was extremely unpleasant. And we were in a room with only three tables! What should have been a fun, celebratory meal was a big disappointment and literally left a bad taste in my mouth. A delightful and delicious lunch spot!! My friend and I enjoyed the special flounder and risotto. We brought friends from out of town who were very impressed with this restaurant. Lovely evening! Friendly staff, neighborhood feel, nice wine list, the food presentation was very nice, and tasted delicious. We're local and we will be back. Always good atmosphere and a good selection of brunch items. The lobster eggs Benedict is awesome. This trip we had reservations for 9:45am on a Friday. We waited until about 10:10 to be seated. Once seated it took about 10min until the server could get to us. Overall the experience was good and the staff is courteous and cheerful. Excellent food. Will go again, despite fact that parking Isabel bit difficult (too few spaces). I had lobster Benedict with fresh squeezed orange juice. It was fabulous! The croissant was also excellent. Food was outstanding and our server, Abdel, was exceptionally knowledgeable and personable. Would recommend to anyone who loves country French Bistro cuisine. Well done, Del Ray Cafe! Never a disappointment eating here! Specials were outstanding--lamb shank and the scallops. Service was wonderful; he never rushed us and gave us lots of time. Dessert was delicious and they provided a beautifully decorated plate for the "birthday girl". Looking forward to returning soon! Once again my Entree was only lukewarm, when I prefer my food to be hot. I may not go back here for dinner again. Family reunion with my cousin from Scotland and his wife. Great meal and ambiance with close attention from Laurent. Very happy! Del Ray Cafe has been a favorite of ours since it opened. Always good food (really good seafood), attentive service and great ambiance. One of the best restaurants in Alexandria! I traveled to the NoVA area with my family and had brunch Sunday with friends; never fails to amaze me how wonderful Del Ray is!! Wonderful service, great atmosphere, food that I’m willing to say could be my “last meal” ;) and of course, family friendly...not sure you could do any better! I will continue to make the journey from Indiana to have brunch as often as I can! DelRay Cafe never disappoints! Every time we have been here the food is delicious and the service impeccable. Quite a treat and the croissants are unbelievable!!! Del Ray Café is consistently good. Attentive service and excellent food. The avocado and crab meat appetizer was delicious. The rest of the meal was wonderful as well. 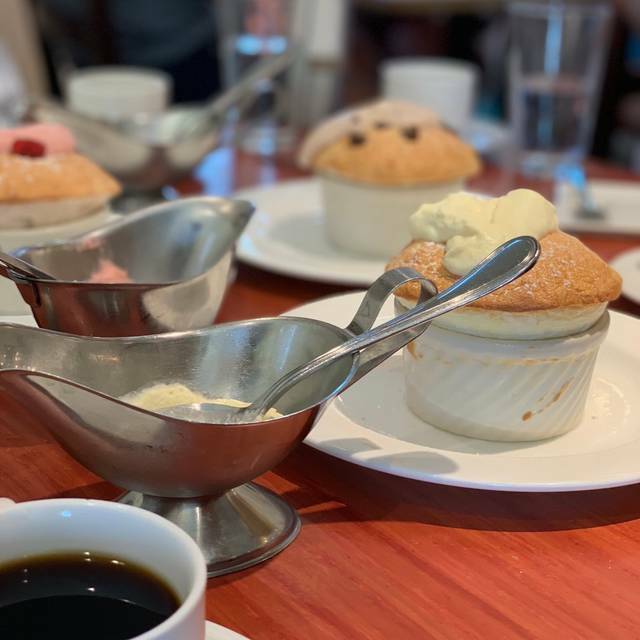 We brought our family (including two little girls) for brunch yesterday and everything was wonderful, food, service, it is one of my favorite restaurants. The restaurant was full, so the noise level was very high. The food and service more than compensated. Our first dinner there, but we’ve also had breakfast/lunch. Cesar took great care of us at lunch, and remembered us a few days later at dinner. Service was excellent, and he food was very good. Venison was perfectly cooked medium rare, with delicious sauce and puréed sweet potato. The short ribs were luscious. The snapper special was cooked perfectly. Carafes of the house red blend worked for all of us. We shared two desserts among the four of us. Overall, a lovely evening. The kitchen smells were the only downside mentioned by our guests...not obnoxious but noticeable. Very creative and delicious selections. Flexible brunch or lunch. We enjoyed the homemade ahi tuna, burger, beet salad, vegetable quiche. The vegetable quiche was not a pie crust and low carb! Best vegetable quiche I have eaten accompanied by fruit and lettuce. My favorite sides. Definitely will meet my girlfriends there again! Service was amazing! Attentive but not intrusive. Charming atmosphere! My rotisserie chicken was really dry. The heirloom beet salad was wonderful. We had all of our party there no less than 5 mins after our reservation start time but it took 20 minutes to seat us. I understand that there is a flow for later morning reservations but we were just left there waiting w the impression it would only be 5 mins before we would be seated and it was much longer. Perhaps just keep the guest informed more on the progress of resetting the table. Excellent food, great service in a renovated older home just around the corner from Mount Vernon Ave. The vibe is casual, friendly and the menu is terrific. 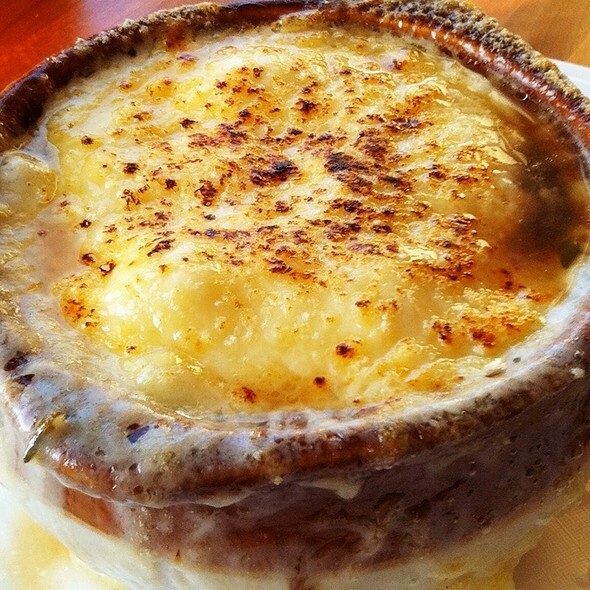 Went with friends who all enjoyed their meals and appetizers which included Burgundy Snails, Peel and Eat Shrimp, a fantastic salad with Blue Cheese, Apples and Walnuts and I really thought my French Onion Soup was fantastic. The main courses were very good and included scallops and mussels. I'm not big on seafood so I enjoyed the tenderloin steak which was tender and flavorful. 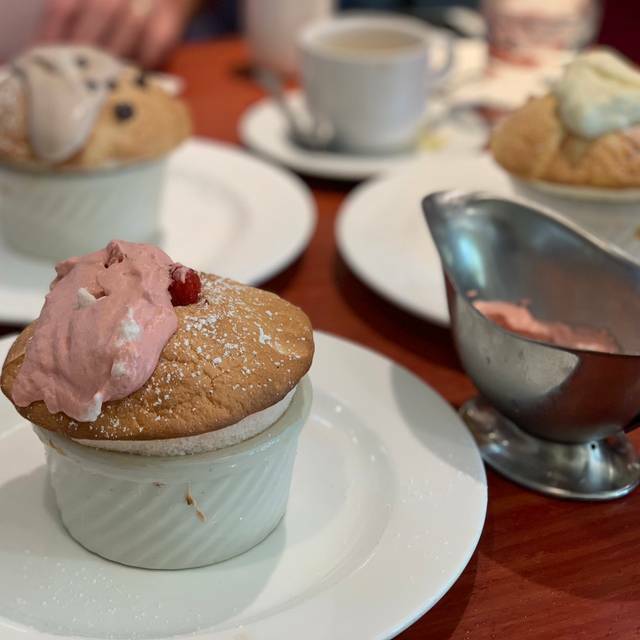 We topped the meal off with a couple of different souffles which were shared among four. Servings were large, so were the martinis! All in all a great, fun local spot that is definitely worth a visit, especially if you like French-themed food. The Del Ray Cafe is a true Neighborhood Gem -- fortunately located in our new neighborhood! From the delicious locally baked bread, through the creative and tasty main dishes, the plentiful sides and of course including the reasonably priced wine of the house, this place deserves its many excellent reviews. The space is warm and homey; the tables are comfortably spaced; and perhaps best of all, our waiter Abdel was the model of attention to detail, efficient service, and warm neighborhood hospitality. We will return to the Del Ray Cafe, and recommend it highly to all. Went for lunch and would go again for lunch and other meals. Cute restaurant. Ate upstairs. Was a bit noisy due to 2 nearby tables. Generally tables are spaced well and the place has a few rooms for dining. Service was good and helpful. The French baguette that was brought to table in the beginning was fresh, very good and just the way it should be...crisp crust on the outside and soft on the inside.I had the burger which was delicious and loved the skinny crisp French fries. Server kindly offered to bring ketchup (honored the American habit) without a blink. My friend had the ham crepe which she said was scrumptious too. Our coffee cups were refilled frequently but not intrusively. We splurged and shared a dessert. The profiteroles 3 puff pastry filled with vanilla ice cream, drizzled withBelgium Chocolate Sauce with hints of raspberry sauce on the plate. Despite being full, we ate every last bite. Lovely find in Del Ray. Next time we will see if we can be seated in one of the other rooms if too noisy. Sorry I didn’t discover this place earlier, but so happy to find it now. Really good food, fabulous seasonal cassoulet, generous, fresh beet salad, interesting wines by the glass. We really enjoyed our meal! We had been told that the first floor might be perfect for us since we had a few hearing issues among the group of four, and most restaurants involve missing bits of the conversation. We reserved there, which is a small dining room with seating for about a dozen people, and were the only people seated there. I think most people prefer being seated upstairs for the buzz, but the lower level was perfect for our purposes, and we enjoyed ourselves. In fact we plan to go back this evening with other friends. We dined earlyish, at 6, and there was plenty of space in the parking lot at that time.